Thank you so much for the great job you are doing with the all these mapping and codecs. Your contributions are precious for the Reason's users. To be able to record Notes and CC through my controller QuNeo, I did implemented the Koshdukai_MIDIChannelX.remotemap and I can now record Notes from my QuNeo. But not the CC. They are interpreted as Note by Reason's sequencer. I guess that I have to modify the Koshdukai_MIDIChannelX.remotemap file. But this is too complex to my knowledge of electronic musician. If that's happening, it must be because the QuNeo is sending MIDI Notes not CCs. See what's being sent by what pad/button. oh btw... try contacting Keith McMillen's support and ask for a specific Codec+Map for the QuNeo, maybe they'll make one. I know they did one for one of their other products (I think it was QuNexus). 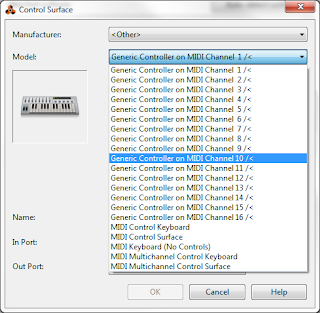 3) I added "Generic Controller on MIDI Channel x" driver for each channel also I've set output & input on "Base II"
Since you're the 2nd person to ask me about this feature, I guess I'll need to make available the tweaked version I did a couple of months ago that seemed to work fine for what the 1st person needed. This new version only works if the controller is expecting to accept the same CCs per control that each one is sending! Please keep in mind that, this is a *GENERIC* Codec as in, not made to work perfectly with a specific controller but well enough with all/any. If you really need a stronger integration with Reason, I guess your best bet would be to contact Livid and ask them about a Reason Codec+Map for that model or at least some help or enough info that may allow you to tweak an existing one, either from them for other model or even one of these generic ones. Sorry for not being more helpful on this, since I don't own that controller, it's quite unlikely for me to be able to make a specific Codec for it or turn any of these generic ones into something more than that. This thread may be a bit old but the topic is real and alive. I just want to say thanks for making and sharing this. It is a definite lifesaver not have to run a third party application at the driver level just to get the integration the Beatstep Pro needs. It is also by far the easiest way to map it to work correctly. The Generic MIDI Channel + Remote Codec+Map is exactly, what i am looking for! Unfortunatly it does not work for me - the new controller is not recognized by Reason...maybe my mistake? Configuration: Reason 8 + Windows 10 (64 Bit). reinstalled Reason - now it works! Great job - had me really scratching my head why I could connect an iPad to a MacBook runningReason via WiFi MIDI just fine, hear and control Reason's instruments from (say) Chordion or SoundPrism for example - but *NOT* record the results onto the seq. track for the instrument in Reason. Kind of glaring functionality omission IMHO by Propellerhead as I can do this natively in Cubase 7.5 with no hassle at all. So really glad to find your Codec with such clear instructions and works just brilliantly. Thanks a bunch, very much appreciated. Hi Kosh, great idea for Reason! I reacently purchased a Beatstep Pro to control a couple of my hardware synths and then came across your codec. I downloaded it, but I don't have the path C:\Documents and Settings\All Users\Application Data\Propellerhead Software\Remote on my computer. I'm using windows 10 and just updated my Reason version to 9.2. Is there another path I could use to get it to work? Great videos, too. Now I'm interested in DrumBrute! If I can get this to work look for donation from me!! P.S. I will pass onto other where they can find this codec. Great work!! Thank you so much! As you might imagine, any donation is very much appreciated. It allows me to also do my own donations to some of the donationware tools I end up using when building this stuff I share for free. Initially I thought of doing a specific BSP Codec but then I ended up using this Channel-aware one more and more with BSP so I put that project to rest. Well, BSP's new 2.0 FW actually finally convinced myself that a specific Codec for BSP doesn't make any sense now, because even the generic "controller" part of it now was taken over by the new features like saving chains as scenes. ...but I'm curious: What would you expect from a BSP Codec, what functionality would you expect from it? Hi. Thanks for creating the remote scripts. I'm still trying to get to grips with Reason 9 and the BeatStep Pro (fw 2.0.0.2) and have installed your remote scripts and set up the control surfaces as advised. Do you have any suggestions what else to configure? - My BSP is connected by USB to the host computer. Which Sync setting should it be using (INT/USB/MIDI/CLK)? - In Reason 9, under Preferences - Sync, should I be sending MIDI to or receiving MIDI from the BSP? I can get sequences to play in Reason from each of the BSP's sequencers but I can't get Reason to start in time with the BSP so must be misunderstanding how this should hang together correctly. 1st you have to decide which will be the Master Clock. 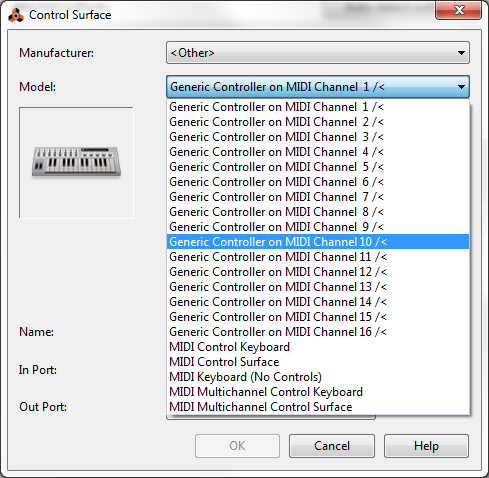 After installation and proper setup and locking to port/channel in Reason, MIDI data does not seem to be filtered. All locked devices still receive on all channels. I can only see 2 explanations for that behaviour. Or, that's only happening with the device currently selected as "current" (the one with the blue rack cursor at the top left of it) which will get MIDI from all the Codecs installed, besides the one being locked to it. In this case, for example, make the Tempo track as the currently selected controller target track. That'll make sure all the other device tracks will be only getting MIDI from their respective locked Codecs. Hi Kosh, with you'r help i can control redrum with my BSP but he doesn't receive information from redrum so the pads of my BSP are not synchronize with redrum..
do you have a solution or explaination about this problem ? Hi Tom, sorry for the late reply (busy week, month even!). Getting MIDI feedback out of Reason (devices) into controllers isn't impossible, but doesn't have a generic solution, unfortunately, because different controllers have different MIDI commands to do what you're expecting (LED control) ...when they even allow it. So, in BSP's case, there's a way to control it's pads (and buttons) backlight LEDs through special undocumented SysEx commands, specific just for the BSP and no other MIDI controller with similar capabilities. So the only way to achieve what you were expecting to happen, would be to make a specific Remote Codec (and Map) just for the BSP, which initially I was thinking of doing but gave up on the idea because I didn't want to make it based on undocumented features I reverse-engineered by trial'n'error and lots of instinctive ideas that down the line could stop working because of some firmware update. That's why I waited for a while, to see if an official documentation of MIDI specs of the BSP was published, which didn't happen (to my knowledge at least). ...and, TBH, since these generic codecs did what I need when using the BSP I had to put my efforts and time on other projects :/ ...sorry 'bout that! your Codec is so funky awesome! Just downloaded and donated. I can play and record now different Reason-Instruments and RackExtensions without touching the Computer that is absolutely wicked! i was just testing this cause i was thinking about to buy the Arturia Keystep (and maybe the Beatstep onTop ...?) and i can´t stop playing. I´ll get the Keystep immidiately! Thanks for your work - great Job!! today the BSP arrived and nearly everything is working as planned. Nearly means: I don´t get the Seq of the BSP properly synched to reason ... I´m sending a Midi-Clock from Reason to the BSP (only way to still record stuff in Reason) but this goes out of synch after some bars ... Do you have any Tipps for this? 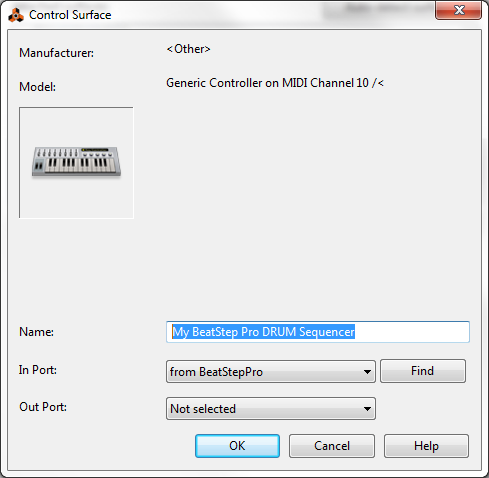 Besides turning on Reason's Sync, Send MIDI Clock option, are you sure you selected the "Arturia BeatStep Pro" device MIDI port in Reason's Edit, Preferences, Sync, MIDI clock sync, Output field? And most importantly (and I'm still doing the basic questions, sorry about that) did you set BSP's SYNC to USB while it (the sequencer) was stopped? If your answer is YES to all of these, then I have to ask if you're just experiencing a constant sync offset (adjustable in that same Reason Preferences Sync tab) or a weird progressive de-sync throughout the time ? I just tried it myself with my BSP and Reason, recording a 50 bar sequence and it was spot-on till the end, not desyncing anytime. hmmm... what BDP firmware version are you using? Is it the latest? the answer is yes to all of your points (incl. Firmware), but i´ve just doublechecked it and i had a 81 bar fun incl. recording it into Reason. But I´m wondering that the Tempo of 94.00BPM from Reason is (while playing) on the BSP changing between 93/94 all the time its playing. I never had such tempo issues using MidiClock and/or AbletonLink with all my other Devices. But anyway - it´s my first day with it & i have to train all that horny features of the BSP and the coop with reason and all my other devices. That display jitter between 93/94 is a natural one that usually happens when sensing external MIDI clock. Found out where the sync goes crazy: it´s the "Roller/Looper" ... i thought it works independent from the sequenzer but it seems to be absolutely luck to get back into the (DAW-)Click on the 1 when releasing it. hmmm... strange. I've just tried it, even while recording and it'll keep in-sync, using any of the loop time divisions at any point of the song. D´you use a Click to proof? I nearly never have the kick on the one again ... really strange if it works fine on yours. Also i found out, that i have to set ClockSend (from reason) to -1 to be save on the Sequenzer-Grid. And i can reproduce the timing-synch-thing: when set reason in loopmode, in this case at 87BPM+4Bars; when starting the track its a bit before or after the 1 and after every loop it goes a little different. this morning i had to restart a track (no loop) 10/11 times to get it into the nice laidback timing that i had yesterday evening with the same track (i saved the Project on the BSP but haven´t recorded the sequenzes as midi into reason). just got an BSP and it works great so far. But there is no tutorial around which covers a correct set-up of the BSP for reason. 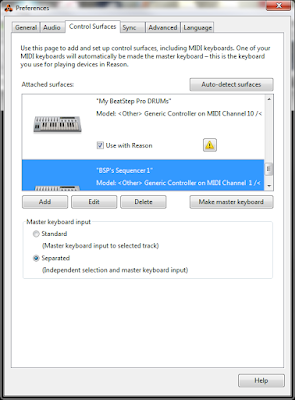 In the reson preferences I have select "other" -> "Midi control keyboard" and set Midi-out to "Arturia Bestatep Pro"
In the sync options I set Midi-clock-out to "Arturia Beatstep pro" too. Sync Mode I set to "send Midi clock"
my Problem is, that I can control (Start, Stop or record" only from reason. When I hit stop or start on the BSP, ONLY the BSP starts or stops without syncronizeing reason anymore. thats one problem. The other is, that I don't know how to use the 3 different sequencers for 3 different reason instruments. Can you make a step-by-step instruction, how to set up BSP proper & best in reason? 1st: You're slaving BSP to Reason so Reason isn't getting any clock or Start/Stop info from BSP. It's exactly the other way around and that's why you're getting that behaviour. To use the 3 seqs you'll need Reason to "listen" to the different MIDI channels, per sequencer, as if there were 3 different controllers. Thanks for the fast reply, so you mean that it is not possible to have "both ways? If this is the case, I will keep this way, becaus reason is first and BSP an addition. By the way, what would you change that reason is the slave? There's ways to have it both ways but it might get you in trouble if not setup correctly or you don't know what's going on or how it works. The easiest way I can think of is for you to use Reason's Remote Override on the Start and Stop sequencer buttons while using the BSP's Transport buttons as simple controller buttons. For this to work, you need to configure the BSP (use the Arturia MCC config tool) in the "Device Settings" tab, down in the Transports section and set the "Transports" parameter to "Both" so each button sends MIDI CC out that'll be used to map those to Reason's Transpor buttons as I described above, with Remote Override. Thanks a lot, I've got everything working. I have the arturia beatstep pro and I was in need of recording the midi, so really glad I found you. One issue here. When I restart Reason, all the sync settings are gone and even worse; all the control surfaces have the error: "The number of MIDI output ports on this control surface has changed! Delete and re-add it." When I use the Arturia the conventional way (assign it to the advanced midi device (no midi recording then)), this does not occur. I also made a template, but no succes. Any ideas what is wrong here? I've began to get that error too lately, since having 2 similar controllers. hmmm... I'm beginning to suspect that it's the latest Reason 10 versions that are causing that. For now, the only way I overcome this recent error is by going to the Control Surfaces, select the controller, Edit and OK. That seems to "fix" (temporarily) the issue. I'm going to report this strange behaviour to Propellerhead to see it's something introduced in the latest versions. Looks like Reason 10.2 doesn't like Out Ports set to "Not selected" which is a bug, since previous Reason versions never complained about (nor they should). Let's hope Reason 10.2.1 shows up soon to fix this. Thanks a lot for the research. Assigning the out port to a non used port helped to let the program remember the devices! The only thing what resets is the sync setting to make the beatstep the masterclock. But thanks again, this helps and hopely the next update the'll fix it. Yes it works brilliant!! Thanks a lot! Just want to say brilliant work, been using this a while now (couple of years), even featured in a video I did (of course I gave you the kudos). I read it's bad to load an instance of Kontakt for each instrumenttrack in Reason. Is this tool also for linking multiple miditracks to different instruments in a single instance of Kontakt in Reason? Nope, unfortunately, Reason 10 isn't yet the Reason version that supports MIDI Channel (and MIDI CC's) to be sent into a VST. When (a future version of) Reason allows what I described above, there'll be other ways to achieve multiple sources (seq tracks or other rack devices, like sequencers, etc) being sent into specific MIDI Channels of a multi-timbral/multi-Channel VST (like Kontakt). So, this is not a tool, it's a Remote Codec+Map (think of like a MIDI controller "driver" for Reason), like many others that are provided my MIDI controller manufacturers or come by default with Reason for specific MIDI controllers and a couple for generic ones. What's new about this Codec is that it allows choosing a specific MIDI Channel instead of working in Omni/All like the default generic Codecs that Reason provides. With this Codec, you can have 1 controller on 1 MIDI port controlling/playing as many rack devices as that controller is capable of sending in separate MIDI Channels. Like many controllers that have keys and pads, you can set the keys to Channel 1 and pads to Channel 10. With 2 instances of this Codec, one "listening" to Channel 1 and the other "listening" to Channel 10, you'll be able to lock the Pads to Kong and the Keys to a synth, as an example... and record them at the same time, just like you do with multiple controllers.